Brand: Kitchen Supply Company KS-7000 Units: 1 Dimensions: 2¾" diameter Create delicious, light and airy rosettes. To use: Attach mold to handle. Preheat mold in hot oil. Dip into batter and place in oil for 1 minute, until delicately browned. Sprinkle rosettes with powdered sugar, cinnamon sugar, or dip in chocolate once cooled. 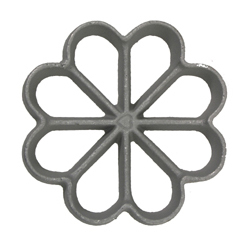 Rosettes keep up to one week in an airtight container or six months in the freezer. Recipe and instructions included. Made of aluminum.